Ask your fish seller to cut the meagre fillet. Remove the skin from the fillet. 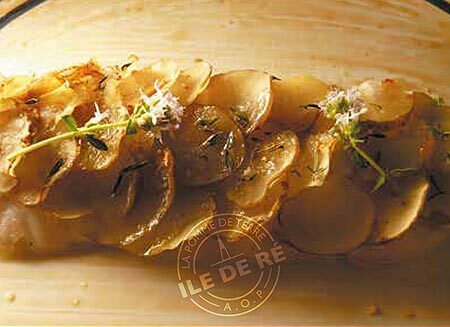 Cut the potatoes into thins slices, without removing the skin. 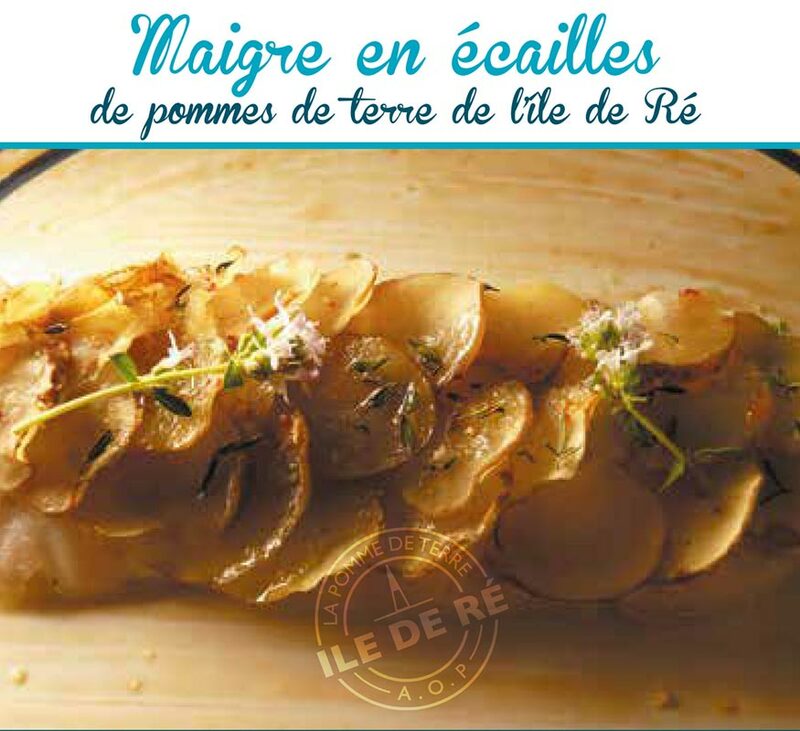 Arrange the potato scales on top of the fish fillets, pour a trickle of olive oil, lemon juice and add thyme leaves. Put it in the oven 10 min at 180°C. Finish the cooking by setting the oven to grill during 5 min, just long enough to color the scales. Arrange on a plate, scatter with salt flower and pepper. Cut the cuttlefish into big pieces et fry them in a pan with a knob of butter and one or two sprigs of thyme during about 8 min (watch the cooking so that they don’t harden). 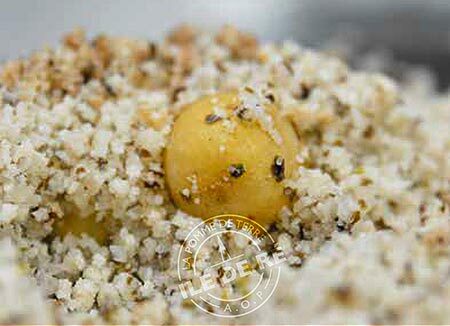 Wash the potatoes without pulling out the skin, and then boil them with rough salt and bay leaves. Once the potatoes cooked, let them cool down before cutting them in half. 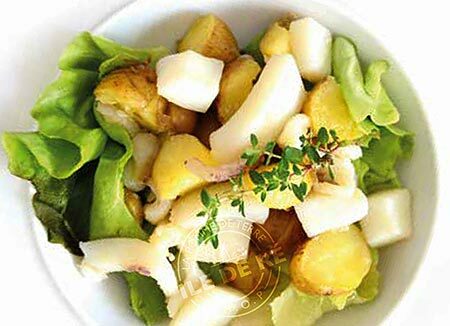 Prepare the vinaigrette sauce by mixing the cooking juice of the cuttlefish with lemon juice, 2 tablespoons of olive oil, a teaspoon of raspberry vinegar and pepper. 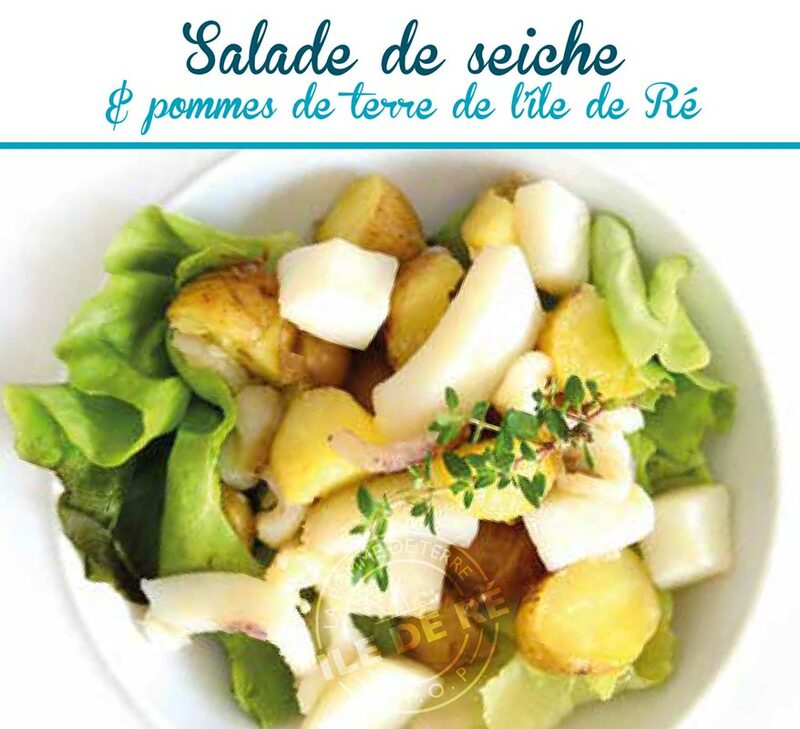 Arrange on a plate, pour the vinaigrette sauce over the lettuce and scatter with salt flower. Boil the potatoes with the skin. Dry them, add a bit of liquid cream and puree them with a fork. Shell the langoustines, cut them in half and remove the black filament in the middle. 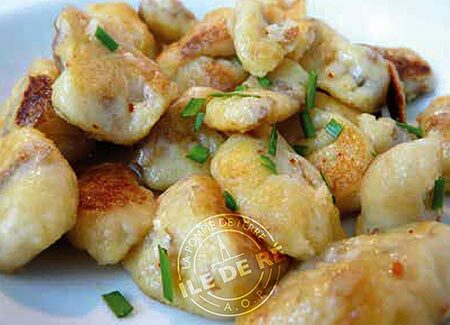 Fry them in a very hot pan with a knob of butter (keep the same pan to cook the gnocchis). Mix the langoustines and add them to the mashed potatoes. Beat the egg and mix with the puree. 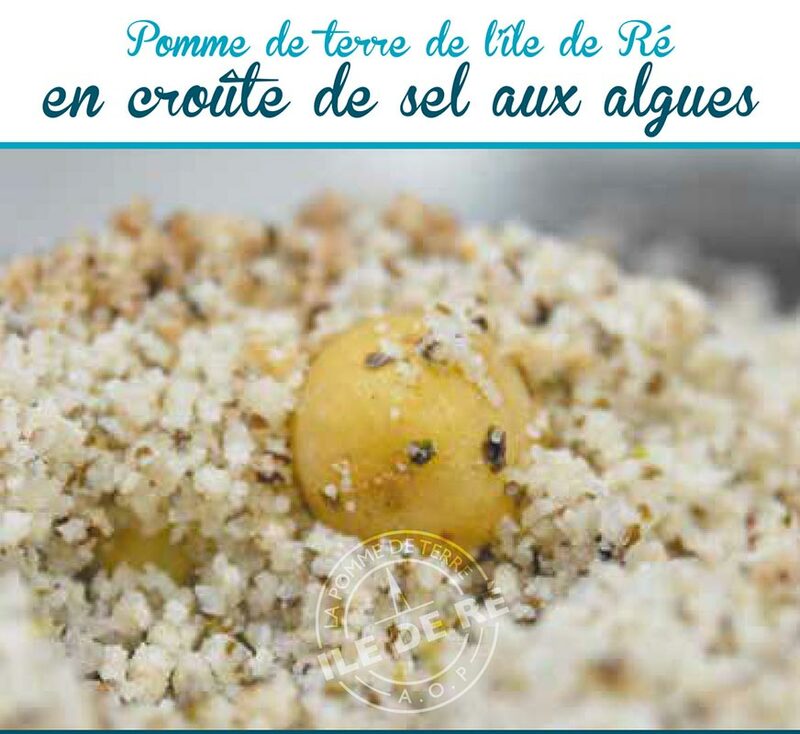 In a bowl, add flour to the purée et knead it until you obtain a ball that does not stick to fingers. Put it on a floured board, form small balls and roll each one until having long rolling pins. Cut them into pieces of about 3 cm. 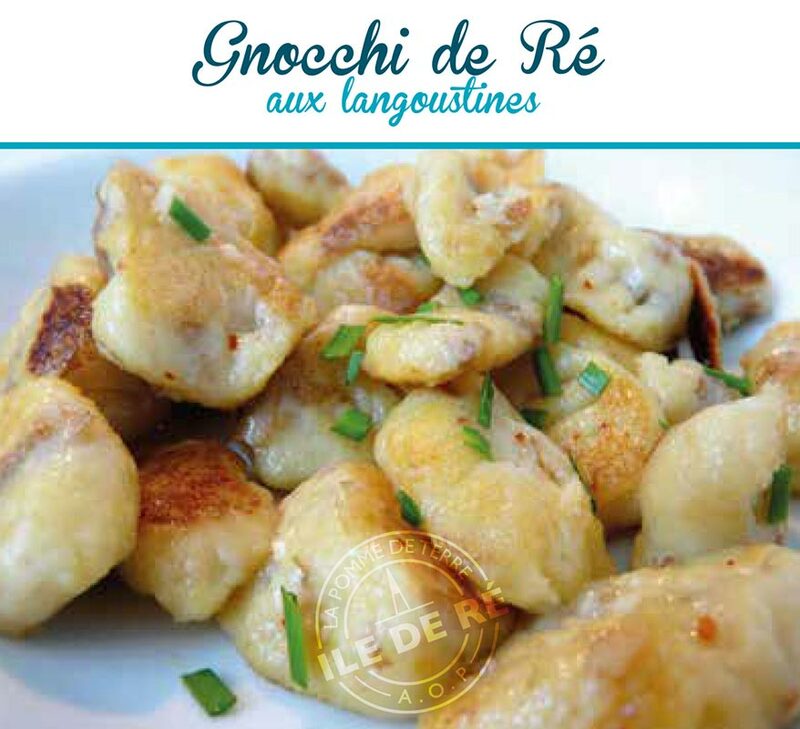 Lean on each gnocchi with the back of a fork to shape little ridges. Put the gnocchis in a saucepan full of boiling water until the gnocchis float. Dry them and fry them in the pan you used to cook the langoustines, until they start to gain color and then arrange them in a plate. Add salt flower, a bit of Espelette chili pepper and chiselled chives. Prepare the beef stock with 30 cl of water and keep it warm. Prepare the potatoes by finely dicing them. Cut the shallot into small pieces, reduce it in a pan with butter. Deglaze with white wine. Add the potatoes in the pan. Once well mixed with the shallot, cover it slightly with a bit of beef stock. Let the stock steep the potatoes. Repeat this during 10 min until the potatoes start to be meltingly soft. 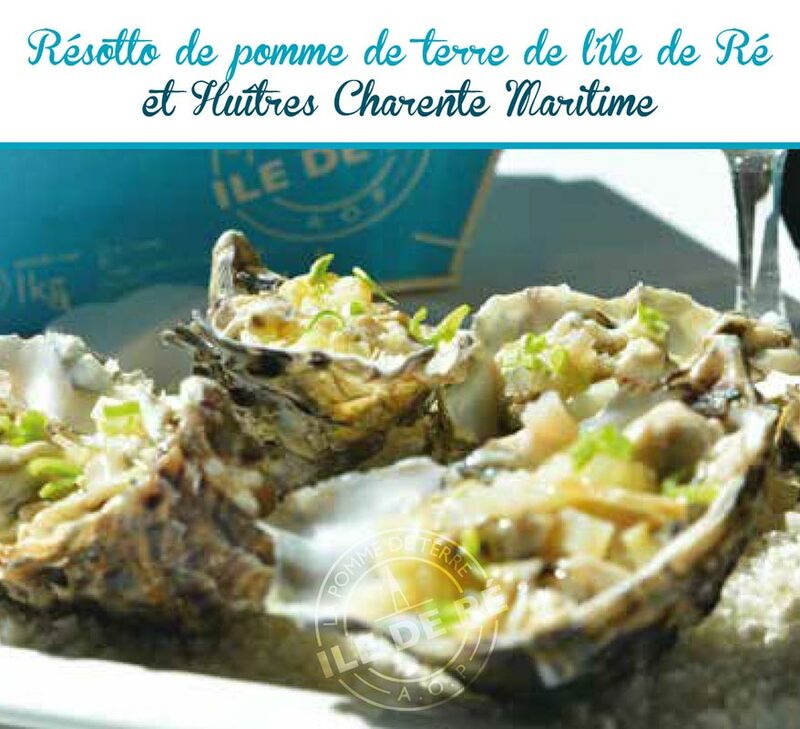 In the meantime, open the oysters, remove it from the shell and save the shells up. Add a bit of oyster juice in the stock. Cut each oyster into 5 pieces. 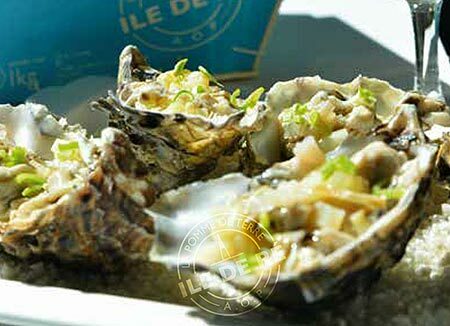 Once the potatoes cooked, arrange them in each oyster shell with the oyster pieces. Add the chiselled garlic and a bit of pepper. In a bowl, mix the coarse salt with an egg and seaweed until obtaining a paste. On a tray, shape a crater with the paste, put the potatoes inside and close the dome. Put in the oven about 20 min at 180°C. Remove from oven and break the crust. The potatoes are ready to be tasted!